It is a widely-accepted truth in scientific research that the quality of your results is dependent on the quality of raw data you analyse. Or to put it more bluntly, it’s a case of garbage in, garbage out. 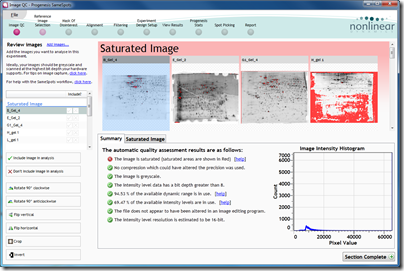 SameSpots provides feedback and recommendations so you can refine your image capture. 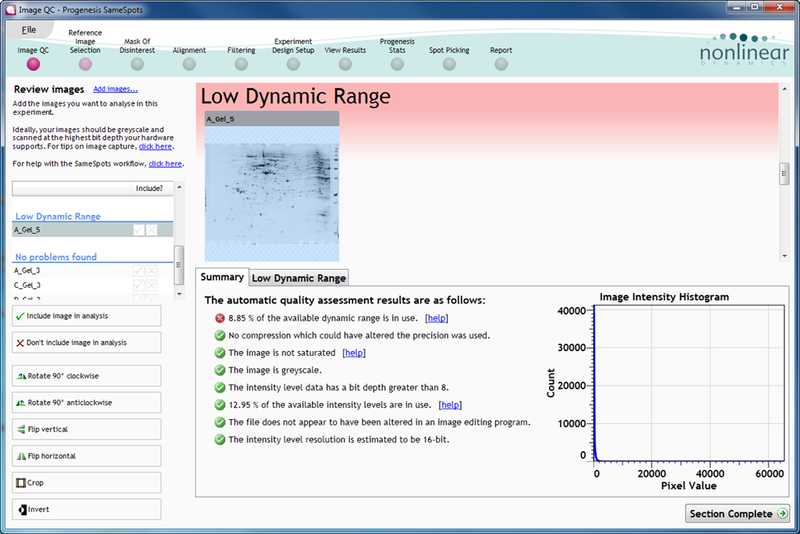 You are still able to proceed with an analysis in SameSpots if one or more of your gel images fail the image QC process, but generally we would advise against it. Here are some examples of images which failed the image QC checks. Saturated image – SameSpots shows areas of saturation on the image in red. 8-bit image – in this image, the pixel data has a bit depth of 8, which isn’t adequate for accurate image analysis (we recommend 16 bit). Low dynamic range – this refers to the actual range of pixel values used. A low dynamic range can mean less precision in the intensities represented by each pixel. The image intensity histogram illustrates the dynamic range of each image. 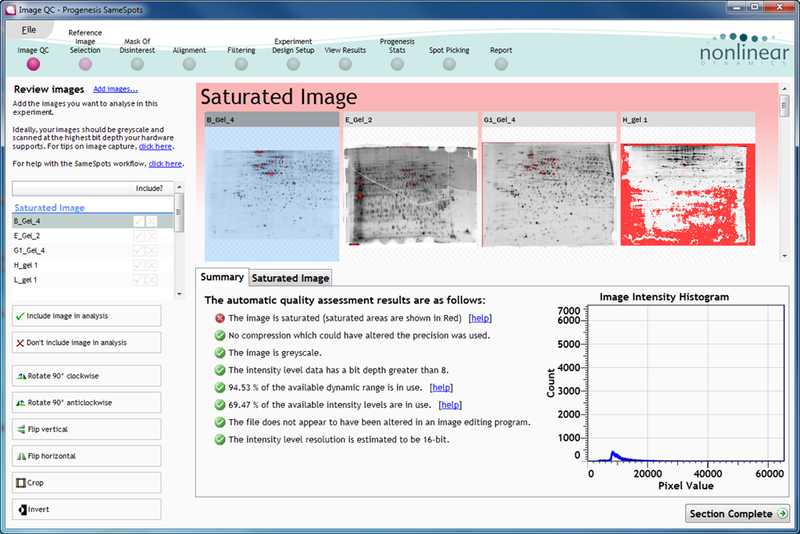 Image manipulation tools are included so you can rotate, flip or invert an image that you may have positioned incorrectly on the scanner bed, and an image cropping tool allows you to remove any material from the edge of the gel image which you don’t want to include in your analysis. 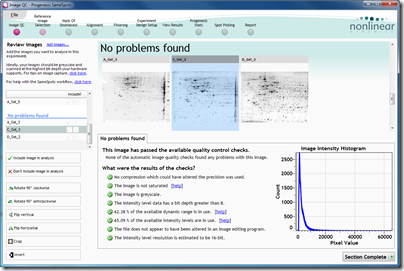 You can use the image QC step in Progenesis SameSpots free of charge! If you download SameSpots, and import your images, they will go through the automatic image QC processes and you will get a report on each image. 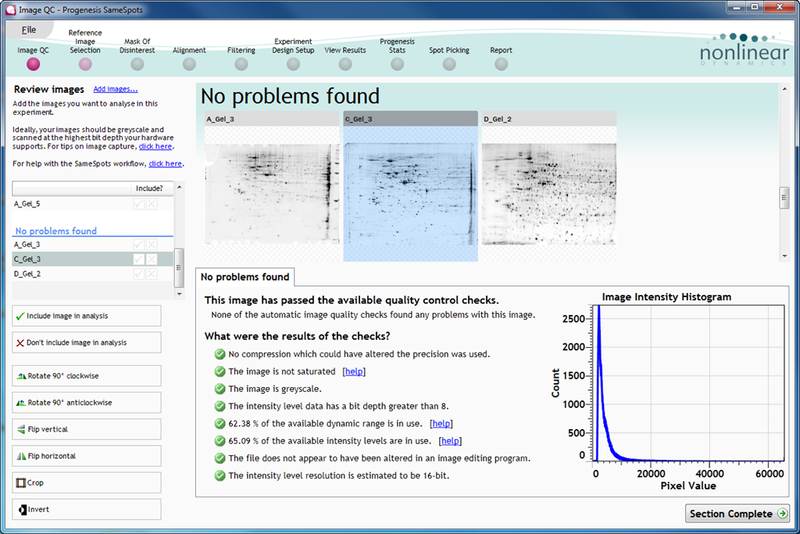 You don’t need a licence of SameSpots to do this; you can QC your image capture on unlimited numbers of images. 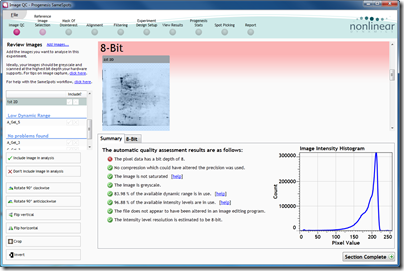 Of course, when you have done the QC on your images, you could use the free image licence code you are sent when you download to do a full analysis on 6 of your images. 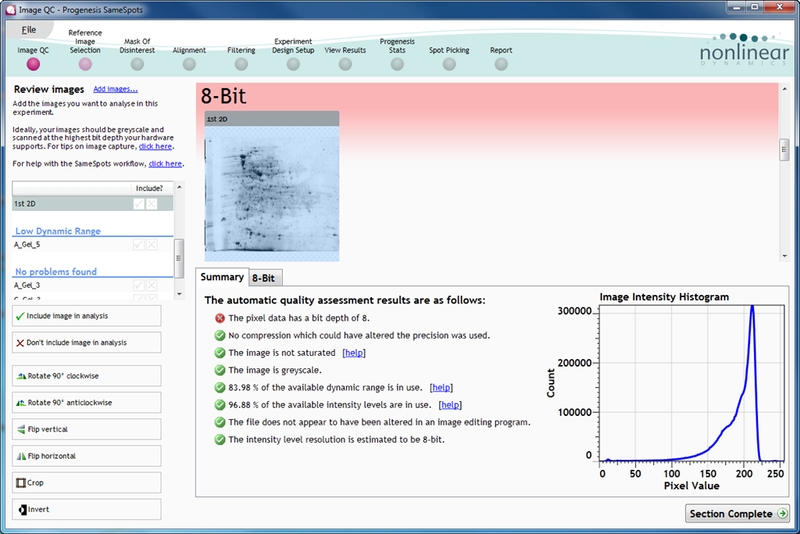 But if you just want to access the image QC tools then we would encourage you to do that. 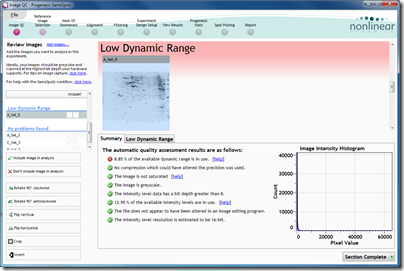 It will really benefit your 2D / DIGE image analysis even if you use ImageMaster™, DeCyder™, Delta 2D, PDQuest or any other 2D image analysis software. I hope all of your images get the green light. This entry was written by Beth McArdle, posted on October 25, 2011 at 3:47 pm, filed under October 2011 and tagged Progenesis SameSpots. Bookmark the permalink. Follow any comments here with the RSS feed for this post. Post a comment or leave a trackback: Trackback URL.